When we think Pixar, we think amazing. That's the general consensus amongst moviegoers; not only do Pixar create some of the best animated films to ever hit cinema screens, but they've won countless awards and generated huge profits at the box office with every one they make. But an undeniable fact amongst audiences is that 2010's Toy Story 3 was their last critically acclaimed hit; Cars 2 was underwhelming to say the least, and last year's Brave had feedback that was generally polarised. Originality and sequels have both been put aside with the company's next hit - now begins the first Pixar prequel and hopeful redemption to some, Monsters University. Mike Wazowski (Billy Crystal) has often dreamed of attending the prestigious Monsters University to become a fully qualified scarer - his dreams come true after years of dedicated studying, but he immediately sparks a rivalry with fellow student James P. Sullivan (John Goodman); a slacker whose fearsome appearance makes him the polar opposite of Mike. When both students become part of the mocked fraternity Oozma Kappa to participate in the annual college Scare Games, their rivalry must be put aside in order for them to prove themselves as not only the best scarers in the school; but the team that opened doors everywhere. 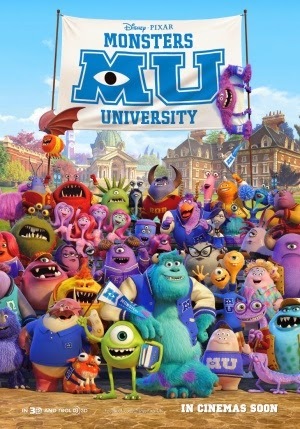 With every new film, Pixar demonstrate their unstoppable reign in the field of computer animation; Monsters University is very different from their 2012 hit Brave, with a greater focus on vibrancy and the potential in a cartoony environment. Nevertheless, it is a gorgeous flick from star to finish; the level of detail and fluency within the environments and the characters almost disguise the fact that you're watching digital animation; there's so much emotion and attention injected into every scene that it wouldn't be a stretch to call Monsters University one of Pixar's best looking films to date. The visuals are accompanied by a catchy and upbeat soundtrack to fit into the college theme and excellent voice work from the entire cast, particularly Crystal and Goodman, and especially Helen Mirren as the frightening Dean Hardscrabble. What really drove the emotional weight of 2001's Monsters, Inc. was Boo and her charming relationship with Sulley. Had that been absent, the film would've really just been a comedy - and that's where Monsters University strives to be. There's not so much of a focus on emotion this time around, with humour taking the helm to drive the story; it actually works well, and the film still yields its own surprises with a nicely developed bond between Mike and Sulley that's also very believable. It ends on a very strong note too, delivering a more complex moral than most lifeless animated hits these days but not so much that it becomes a depressing ordeal. From the minute it starts, Monsters University soon becomes one of the funniest Pixar films and by the time it ends you can't not want to smile. Aside from some pacing issues and a few plot holes, the film doesn't have any serious faults; what drags it down is that it just doesn't aim very high. It doesn't try to set the bar like other Pixar efforts (save a few), but this isn't a serious problem - it's just the reason why so many were unsatisfied and why it can't be the best animated hit of the year. It's almost impossible not to enjoy it - as a comedy film it certainly delivers, but it will feel like something is missing for many people. Perhaps it is best to appreciate it for what it is rather than moan about what it isn't.